It’s the day after Purim, which means no one will need this info till eleven months from now, but I need to process and vent and share asap. If you are in charge of all or part of a Purim Carnival AND you are obsessively detail-oriented, this post is for you. I tried the mitzvah-centric carnival idea (which I wrote about here) and it worked. It worked despite the fact that our synagogue is neither accustomed to making “suggested donations” at the door, nor dealing with play money (Mitzvah Money) instead of prizes. My director and the high school teachers were totally on board and let three grades create displays for three charities that were the focus of the room (under a gazebo Tzedakah Tent). Students wore sandwich signs, color-coded to the display and the collection jar, and strolled the room advertising the charities. The jars stayed under the Tent, and the younger kids ran to them with newly-won Mitzvah Money. My own kid said that stuffing Mitzvah Money into the pushkes was his favorite part of the (very fun) carnival. Wow. When school meets again, those three grades will do the calculations to find out how much was actually raised for each charity. But, what did everyone do to win Mitzvah Money? What were the booths at the carnival? I scoured the internet for ideas from other carnivals, but what I found was not accompanied by many details. I need details. And some games, while fun, just weren’t thematic or hands-on enough for me. Or, they were the type that involve mock-violent action against a Haman effigy or a villianized Vashti. I am not comfortable with punching bags, whimsical hanging / decapitation games and pin-the-tail on a pock-marked Vashti. 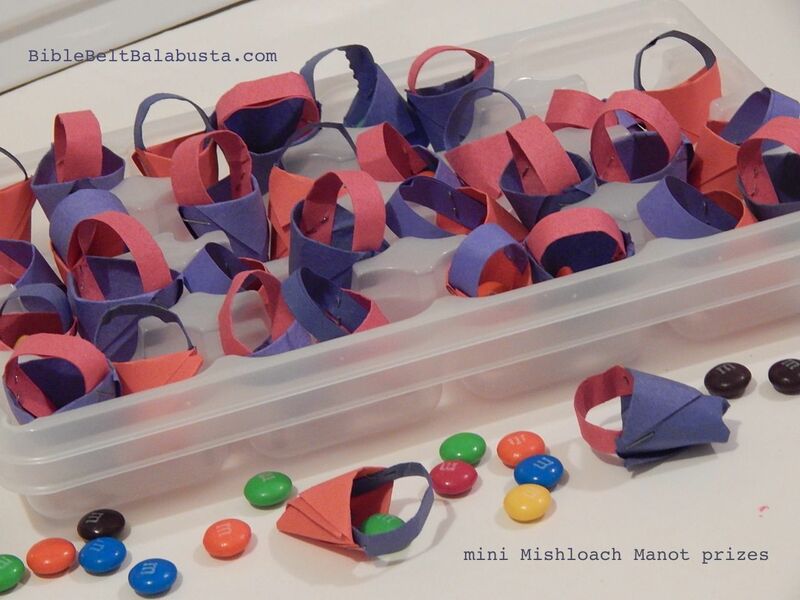 •Mishloach Manot decorating, tagging, filling (whole school at same time). •Tzedakah Tent (described above and at Mitzvah Fair post). 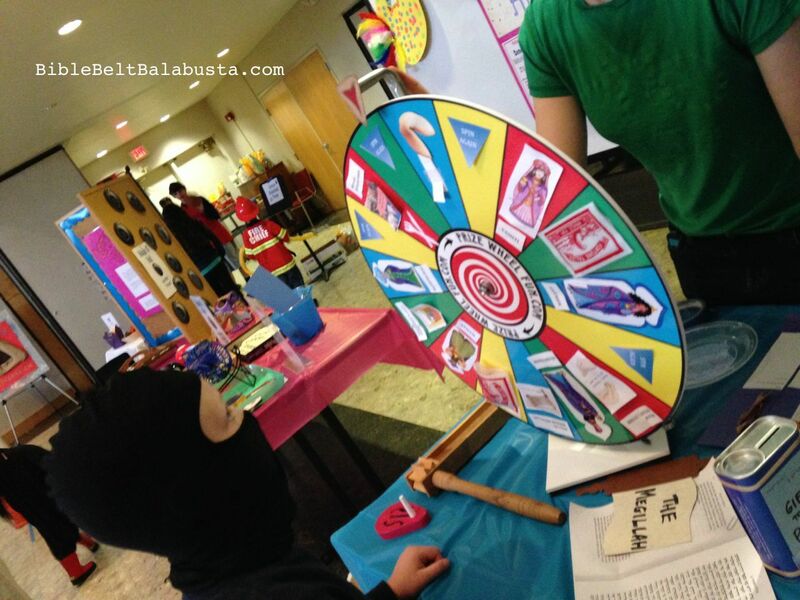 •”Wheel of Purim” (24″ prize wheel). After the Tzedakah Tent, this was the focus of the room’s action. Wheel was decorated with pics of Esther, Mordechai, King A., Haman and Vashti, plus each of the 4 mitzvot. Thematic consequences to each. King A had to wear a giant crown, Mordechai had to ride a hobby horse, etc. My favorite were the teeny origami mishloach manot bags won if you landed on that mitzvah, which you then had to “send” to someone right then. •”Lots of Purim” display (Pur = lot, Purim = lots) Various pieces for fortune-telling and games of chance, including “knucklebones,” which some sources say were what Haman could have used to cast lots. •Fishing For Fortunes (in pond liner tub with a few inches of water, with signs explaining link of fish to the month of Adar). Fish came from Target Dollar Spot, but the rods were wooden dowels with string and a modified paper clip. 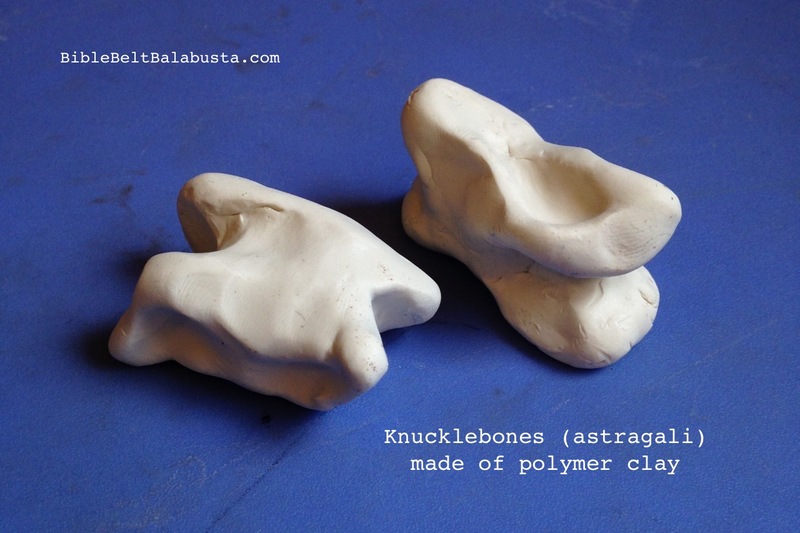 •Playdough Hamantasch practice: “can you make a triangle from a circle?”(printable sheet and lesson plan here), plus extra cookie cutters in Purim shapes. •Hit the Hamantasch: see my post about making this game. A nice byproduct is that the game reinforces vocab by making the leader and kids say mohn and lekvar. Don’t forget to mark the throwing lanes with blue painter’s tape. •Esther’s Nail Spa: with a printed picture of Midrash Manicure’s hamantaschen nail art as inspiration. Toothpick applicators provided. Okay, this booth was just fluff, but a certain demographic flocked to it. •’Stache on a Stick: kids traced and cut a variety of mustache shapes/sizes and then stapled to a straw. Like photo booth props. Hand mirrors provided. (This fits in with Purim’s disguise / mask theme.) The little kids did not really understand this station until they saw older kids using the mustaches. •Magic Scratch Masks: from Oriental Trading and Benny’s Educational Toys. I added a cheat sheet in case kids wanted to spell Purim, Chag Purim Sameach in Hebrew. •Decorate a Crown: plain and with outlines. Markers, adhesive jewels, foam letters. (no glue or paint this time). •Pin the Crown on Esther: I drew and laminated a big drawing of Esther, made a big, flat crown out of sparkly craft foam w/ jewels, and made a tiny gold crown out of a tissue paper roll. This was my sneaky, non-gendered way of attracting kids who like big and glittery and who hate big and glittery. Blue painter’s tape wadded on the back of each made them stick. For a mask, I used a Magic Scratch Mask with eye holes covered by Purim stickers. •Fortune Teller: in keeping with the fortune/ chance theme. I used my beach cabana draped with sheets and two tiny wooden chairs. Crystal ball was an upside-down round, glass vase filled with red cellophane and 2 twinkling LED tea-lights. It sat atop an upturned contractor’s bucket covered with a paisley shawl. •”Print a Fish for Adar:” see lesson plan and pictures at my post here. Fish is a symbol of the month of Adar. I used my rubber fish from the art supply store. • Shushan Soccer: just a Foosball table re-named with posters. (Say Shushan Soccer three times fast!) This game was just a way to let off steam. The little kids had never seen the table before and they loved it. Note: bring extra balls. I started with four and ended with zero. •Haman Basketball: indoor bball with return net. I drew a hideous picture of Haman and taped it to the backboard. I don’t like the games that involve hitting Haman with mallets and whatnot, but this one seemed acceptable. Don’t ask why because I don’t really know. The bigger kids loved this. Talk about blowing off steam. I dug this out of storage and boy, was it worth it. •Purim Finger Puppets: Paper templates to color, cut and tape; felt puppet theatre, book of Purim story (Tomie dePaola’s). The adorable puppet sheets are from Secret Agent Josephine via The Shikska.com. •”Order” the Whole Megillah: giant flannel board with one wooden scroll (painted tube from fabric bolt) on left side. Story of Purim in 12 cartoon panels, laminated (each 8.5 x 11), with velcro on back. •Face painting: our AirBrush tattoo guy didn’t show up, but I had two new packs of face paint crayons in storage, and extra hand mirrors. The 10th graders who volunteered to paint faces did a wonderful job. •Balloon Guy. Big hit. Kids colored on a paper tablecloth while they waited in line. with a simplified Make Your Own Sundae: just ice cream cups with jimmies, sauces and whipped cream. A sign nearby explained that Queen Esther was the original Dairy Queen (supposedly, she kept secretly kosher in the palace by avoiding meat). The entire morning made sure everyone fulfilled the Four Mitzvot of Purim together, knowingly and enjoyably: Hearing the Megillah, Giving Gifts to the Poor, Sending Mishloach Manot and having a Festive Purim Meal. Being a “Mitzvah-centric” carnival, it could use some kid-created booths that are mitzvah-centric and still Purim-esque. I’d like to do upcycled Mishloach Manot for sure. Someone suggested building Shushan Palace from donated food containers (which will be sent to the Food Bank). What are other stations / activities that would meaningful and fun? This entry was posted in Activity, Crafts, Purim and tagged Purim Carnival, Purim Mitzvot. Bookmark the permalink. this looks fabulous!! I need to plan my next vacation to visit your shul in Nashville. You’re an inspiration! You’re amazing! Thanks for the wonderful ideas…. Glad you found some useful stuff. Thank you!